The year 2016 marks the 100th anniversary of the “Escadrille Américaine” or the Lafayette Escadrille. Created on December 6, 1916, the Escadrille (or “squadron”) holds a unique place both in the history of World War I (1914-1918) and in the history of aviation overall. Most notably, the Escadrille was composed of American volunteers who chose to fight for France years before the United States’ official entry into the Great War, in April 1917. 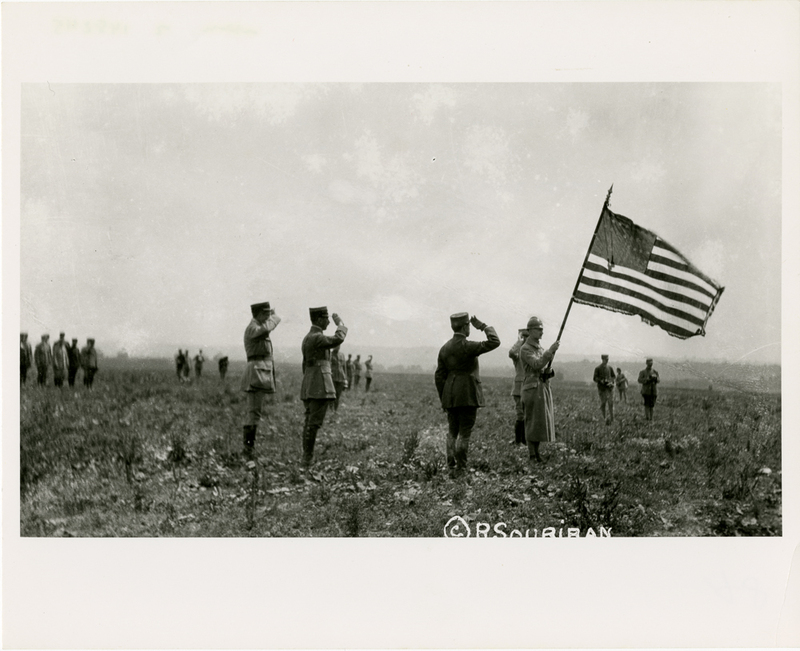 Photograph of the presentation of the Lafayette Escadrille’s squadron flag at Chaudun, July 7, 1917. Smithsonian National Air and Space Museum (NASM A-48757-B). At the time of the Escadrille’s inception, many American volunteers were already serving in France as soldiers in the French Foreign Legion, or as volunteer ambulance drivers, when the opportunity to train as pilots and fly as an all-volunteer American squadron under French Army command was initiated. The squadron “became operational in April 1916” and retained its American pilots till just before Christmas in 1917, when they transferred to service in the U.S. Allied Expeditionary Forces in Europe. The commander of the first squadron of American volunteers was Captain Georges Thenault, a French Army officer and pilot. It is two of his operational logs that were given to the Smithsonian by his widow in 1962. 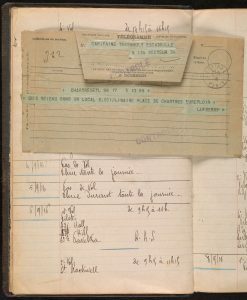 The logs document the dates of missions, the pilots who flew and the events as they were reported and recorded by Captain Thenault, from August 24, 1916 to February 1, 1918. 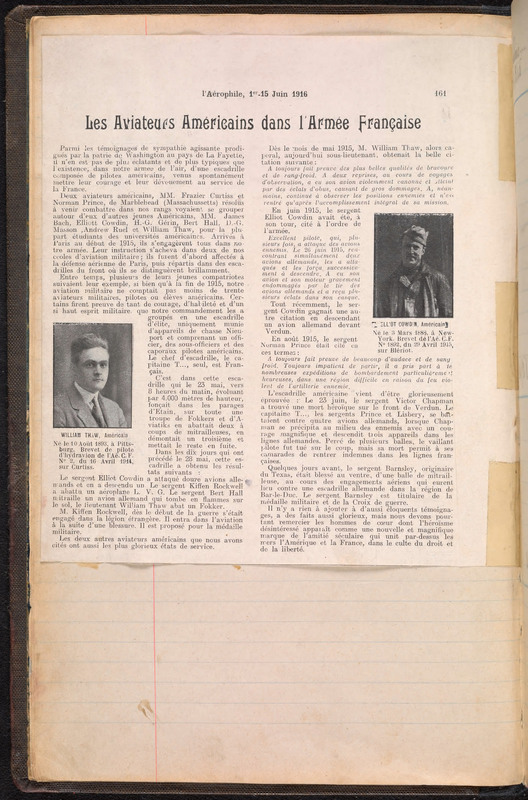 Volunteers for the Smithsonian Transcription Center produced the readable text of the Escadrille mission logs from the hand-written original, viewable here. 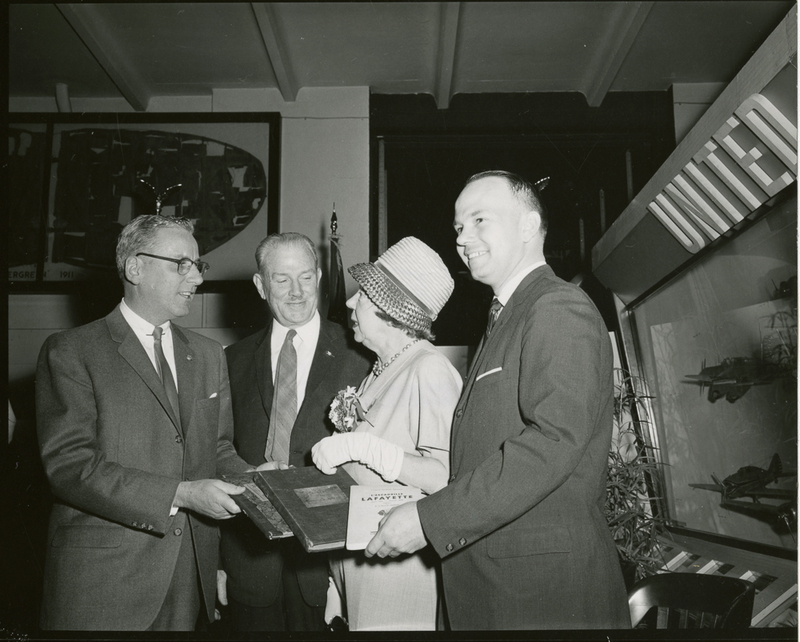 Presentation of the Journal de Marches et Operations of the Lafayette Escadrille by Georges Thenault to the Smithsonian Institution, National Air Museum, April 19, 1963. Left to Right: Mr. James Bradley, Col. Charles H. Dolan, II, Madame Thenault, Mr. Georges Thenault. Smithsonian National Air and Space Museum (NASM 00193526). The squadron was operational beginning in April 1916 and a few pilots did see air combat—losing one pilot killed in action and another to serious injuries after being shot down. The squadron was not comprised exclusively of American pilots. Of the officers of the squadron, the captain, Georges Thenault was from Paris, France; Lt. Alfred de Meux De Laage was from Clesse, France; Lt. William Thaw was from Pittsburgh, Pennsylvania; Lt. Antoine de Maison-Rouge Arnoux was Verdun, France; and St. Louis Verdier-Fauvety was from Meaux, France. While the majority of the French squadron’s officers were understandably French, four Americans achieved the rank of Second Lieutenant: Norman Prince, Raoul Lufbery, Edwin Parsons, and Kiffin Rockwell. 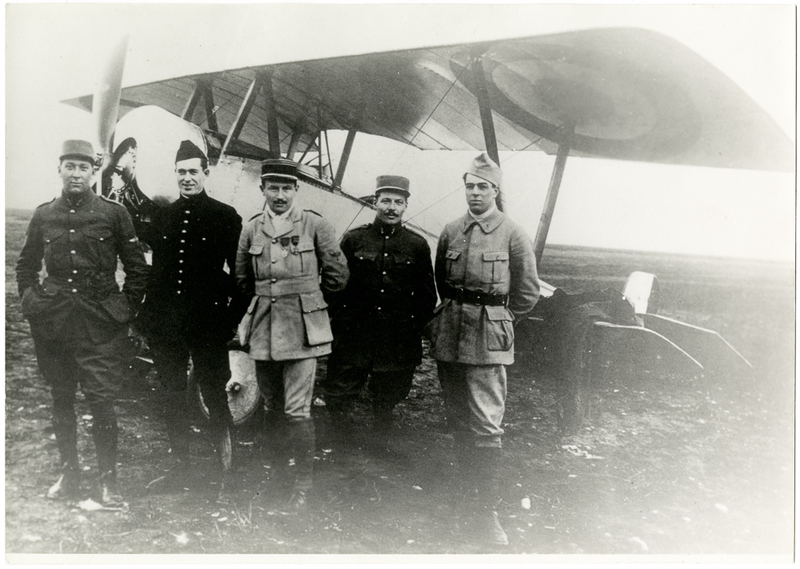 Informal group photograph of early Lafayette Escadrille members (left to right) James McConnell, Kiffin Yates Rockwell, Captain Georges Thenault, Norman Prince, and Victor Chapman; all posed in front of a Nieuport XI at Luxeuil, France, 1916. Smithsonian National Air and Space Museum (NASM 00171919). Over the squadron’s time in action, leading up to the transfer of the Americans to U.S. command, there were 43 different pilots in the roster: 5 of these pilots were from France, and the other 38 came from across the United States, from California and Texas to New York, Massachusetts, and Connecticut. Fourteen of the volunteer pilots died either in the line of duty or in action, three were captured by the enemy, and four more were wounded in action. The squadron also contained a supporting animal contingent of mascots: two lion cubs named Whiskey and Soda and several dogs. 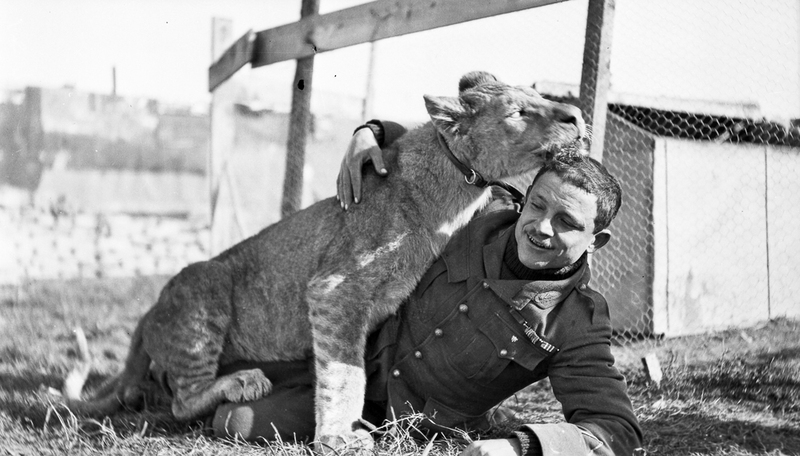 Informal photograph of Gervais Raoul Lufbery and the Lafayette Escadrille’s mascot “Whiskey” wrestling on the ground. Chaudun, July 1917. Smithsonian National Air and Space Museum (NASM 2005-17461). Unlike depictions in popular films, the war in the air involved far fewer dog fights, and pilots were lucky to get a kill at all during the duration of their service. A normal day of combat would involve a single dive on an enemy plane, the firing of around 10 rounds, and a gun jamming. In the end, most pilots would go home with an engine or gun malfunction. Page of Lafayette Escadrille logbook, with telegram to Captain Georges Thenault. The information provided here is the result of the efforts of Smithsonian Libraries intern Andrew Boynton, a student at Penn State University, who diligently worked to translate the French to English and compile and sort its data.